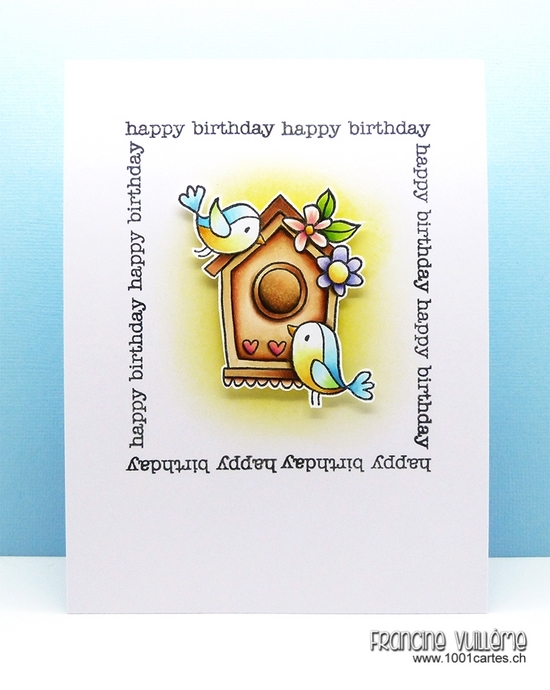 I first stamped the rectangle that I made with a happy birthday sentiment from the Snippets (#30-283) stamp set. I then sponged the background with Distress ink. I colored the adorable bird cage and the birds with Copic markers and fussy cut it with sharp scissors. To finish off my card, I fixed the image with foam pads to the background for more dimension. For more clean and simple designs and inspirations using Penny Black stamps, head over to the PennyBlack Simplicity blog. Francine, your beautiful scene that is illuminated in pretty yellow light is remarkably pretty and so soft. And I really love the way the sentiment text creates a frame for the images. Very classy and awesome card. What a Lovely card it is ! I really loved the frame you have created by stamping sentiment !